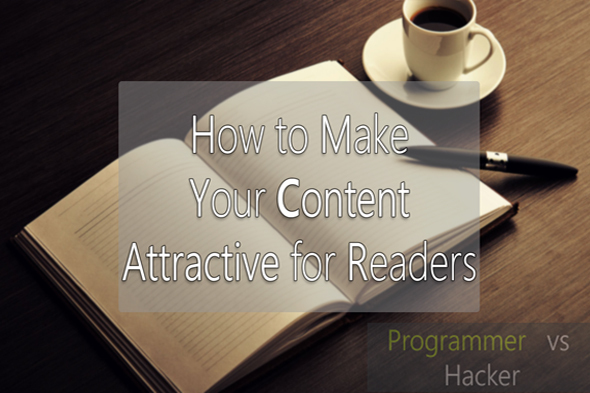 Are you heading to make your content attractive? Do you want to increase the readability of your content? If your answer to these questions is yes, then you may follow this article of mine. As today I am going to share some of the unexpected tips which will help you to make your content attractive and will help you to increase your readability. The content of any site or blog is one of the prime things which is required for the success of it as content is the key aspect that gathers users around it. Every blogger want to make their content attractive and look good so that they can increase the blog readability. The Content is considered as the king in blogging, but you must mold and present it in unique way. Since, the appearance is going to compel the readers that what actually exists in your content. So, here thing is proved that you need to work on the appearance of your content too which can help you to make it attractive and can get you more readers. So, here are the tips which you are supposed to follow for making your content attractive for your readers. Once you’ve applied these tricks then you’ll definitely record the change in readability and response from your readers. So, if you want to survive in blogging world and are really interested to provide something attractive for your readers then start with providing something unique. Believe me that once you’ll start sharing unique content on your blog then you’ll see the great respect and response from your readers for sure. Another most important tip which you must follow is analyzing your audience. I have seen many bloggers who write for themselves, but in blogging you need to write for others. You need to write what your readers want, not you. And, for that you must analyze your audience and ask them what they want. Now, you must be thinking that “how to ask them?” So, you may use following platform for interacting with your readers and ask them about their interests. When I say controversies that means I am suggesting you to write on something catchy and trendy. You must go with trends and see that what people are liking and what you should share. It really helps. You may go for keyword research and other tools to search for controversies. When you write your content in conversational or talkative manner then it makes your reader comfortable and the reader get connected with your content. So, start applying this tip and see the change. Everybody makes mistake while writing their content in first go, so, you must proofread your content before making it live for your readers so that you readers may not experience any kind of errors in their reading. I know that proofreading can be time consuming. But, you don’t need to worry about it now as there are many proofreading services which are working for you and I have listed two of them below. You may choose best professional proofreading service of your choice. So, these were some tips from my side, I am sure that you are going to get your solution from these. If you have any questions to ask related to this guide then lend them in comment box. I shall get back to your questions as soon as possible. Was it helpful? If it was, then do praise us by your shares and likes. Your share may help any of your friends out there, who is searching for the same stuffs.